The newest Samsung Galaxy tablet is now offered by Smart for only 999 pesos a month. 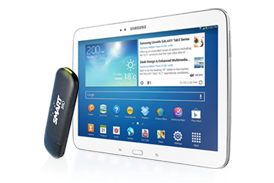 Get that Galaxy Tab 3 10.1 inch with free Smart Broadband Plug it USB modem at postpaid Plan 999. Take home the two gadgets in one plan plus you'll be getting a free 50 hours of internet bundled monthly. You'll have an option to get unlimited internet with no top of the bill charges when you reach the allocated amount on the Anti-Bill shock protection. Smart offers wide varieties of tablet plus broadband bundles, you can also check their Galaxy Note 8 tablet at Plan 999 that comes with free Pocket Wifi. To those who want a prepaid Power Plug it broadband you can get the device for only 1245 at Smart Online store, it comes with text and browsing freebies.